Stephen is a competitive archer and archery instructor in the Oakland area, specializing in recurve archery. He enjoys the meditative focus of the process of shooting a bow and arrow accurately, and likes helping others achieve proficiency in this interesting and challenging individual sport. 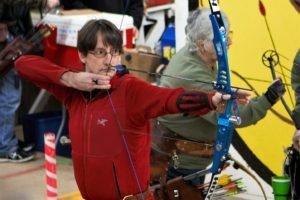 Stephen runs the introductory and intermediate archery programs at the Redwood Bowmen archery club; he is also the ONLY Coach/Certified Instructor with a permit to teach outdoor Field Archery there (you must have your own equipment for this). He offers private lessons and coaching for beginner through advanced students, ages 8 and up, at Ohlone Archery. If you are interested in private lessons, contact Stephen Williams, at steve@icarus.com. (510) 686-3392. Stephen contributes to the Ohlone Archery Blog – type “Stephen Williams” in the blog search engine.